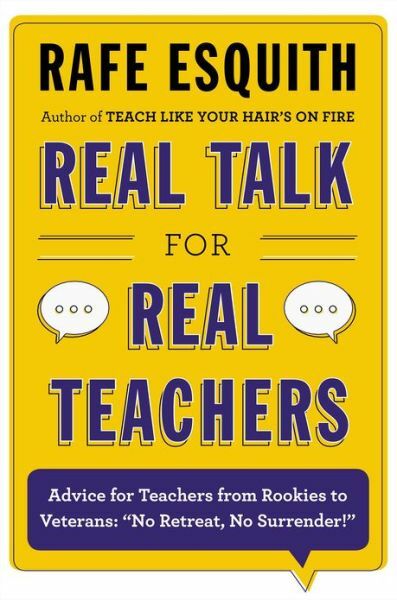 Two things struck me as soon as I metaphorically cracked the spine of my e-version of Real Talk for Real Teachers, the latest opus by best-selling author and public-school teacher extraordinaire Rafe Esquith: How many of his ideas were borrowed by KIPP. And, yet, how radically Esquith’s philosophy and his renowned teaching methods differ from those we’ve come to associate with KIPP and KIPP-like charter schools. Esquith is the specter that haunts KIPP’s founders in Mathews’s book. He is one of two mentors whose teaching practices so influenced Dave Levin and Michael Feinberg that they even appropriated Esquith’s motto, “Work Hard. Be Nice.” But, tellingly, Esquith is the mentor whom Mathews dubs “Mr. Outside”. He is, it turns out, the anti-KIPP. If KIPP and the entire no-excuses charter-school movement has become associated with strict discipline and devotion to the 3”R”s and to test prep, Esquith is all about the importance of self-motivation and learning-by-doing, especially doing art. While charters like to hire newby teachers, chief among them legions of TFAers—though the best KIPP schools have learned to avoid putting first-years in charge of a classroom—Esquith’s book is aimed at blackboard veterans, no doubt the “Real Teachers” referred to in his title. He makes the outrageous proposition that experience matters—in teaching as in so much else. The divergence between what KIPP borrowed from Esquith and what actually happens in Esquith’s classroom is important. While KIPP is constantly fine-tuning its methods (more on this here), the burgeoning charter school movement has come to mimic some of the most obvious Esquith-derived tools in the KIPP playbook, such as the slogans, Saturday school, paychecks and trips. But they are missing the spirit behind these innovations—especially the need to foster a love of learning and the habits of mind needed to become an autodidact. This reductionism reminds me of W. Edwards Deming’s fury when corporations would cherry pick his quality management philosophy for the elements that appealed to them the most—whether statistical process control or quality circles–without understanding the importance of his overall philosophy or the systems they were managing. “Off to the Milky Way,” Deming would roar. Esquith begins with a visit to the Sistine Chapel and the observation that the Michaelangelo who painted the front wall of the sanctuary was an older, “gloomier” artist than the exuberant youth who had painted the ceiling. Even though Michaelangelo had “grown, changed and suffered,” writes Esquith, he was still a brilliant artist. Esquith then proceeds to wipe the floor with Michelle Rhee and, by association, with education reformers who promulgate teaching as a drive-by profession, something any young person with a college degree can do. “Nobody makes a thirty-year or ten-year commitment to a single profession,” he quotes Rhee, the former Washington, DC school’s chancellor and privatization advocate, as saying. Flicking at the naked opportunism suggested by Rhee’s quote, Esquith says: “Lack of commitment is seen in every facet of our daily lives, from personal relationships to the renegotiation of contracts…there is something to be said about a teacher who stays on the front lines,” says Esquith who has done just that for 30 years. The choice of Michaelangelo is also a telling metaphor. For Esquith’s teaching is all about art and music and experiential learning. The first chapters of his book are dominated by anecdotes about the guitar lessons, museum visits, drama, film club and other sundry artistic pursuits he brings to his classes; little is said about the nuts and bolts of teaching math, English, history and science. While the arts have been elbowed out of both public and charter school curricula by test prep, with dubious long-term results, the way he weaves art into the curriculum, Esquith suggests, is one reason large numbers of his low-income students wind up not just at college, but at places like Stanford, Yale, Oberlin, Williams, Princeton, Colby, Notre Dame, Tufts West Point etc. etc. “[T]hey are not only having fun making a rug but taking the first of many steps toward understanding a key lesson: there are no shortcuts. After an hour or so, most none of the children will have finished sorting their yarn. But more often than not, the kids have had fun, and they are not complaining. Instead, they have begun to realize that the process is more important than the finished product. KIPP also borrowed Saturday classes from Esquith. While Esquith uses the classes to help former students study for the SAT, Saturdays (and vacations) are also for rehearsing the Shakespeare play the fifth graders produce each spring. Indeed, Esquith and his Hobart Shakespeareans have become famous for the quality of their plays, winning praise and support from no lesser lights than the Royal Shakespeare company’s Ian McKellan. –A lot of vocabulary, which improves their reading, writing and speaking. All Men (and Kids) Are Created Equal. Or Are They? Esquith’s book is scathing on one subject in particular—the role of bureaucrats, including their one-size-fits-all directives and lesson plans. Much of Esquith’s book is dedicated to helping teachers tailor their lessons to the very wide range of skills and deficits of their kids. But Esquith’s most interesting—and controversial—argument is that kids are neither created equal (few would argue that they are), nor that they should be treated equally. Like many critics of the current reform movement, Esquith contends that parents are a much more important factor in a student’s academic success than are her teachers. In fact, he challenges the prevailing assumption that it is the teacher’s responsibility to ensure that all kids succeed. Teachers owe every child an equal chance at success—as Esquith puts it, a full menu of options—but what they select from the menu, is really up to each child. Indeed, Esquith suggests, that to survive teaching and to create a sustainable classroom, teachers need to engage in a kind of triage. “Some children need to be left behind,” argues Esquith. “not the ones who are struggling with the material, or whose problems make focused learning difficult, but there are students who have not earned the right to move forward. Whether you agree with Esquith or not, in the era of No Child Left Behind, this view is heresy. Traditional public schools are supposed to bring ALL children to grade level. Charter organizations like KIPP insist—with little credibility—that there is no difference in the make-up of their classrooms and the public schools down the block. I couldn’t help but wonder whether, in fact, this is one Esquith lesson that KIPP and Co. have absorbed—though not quite the way he intends it. To be clear, while charters are criticized for taking fewer kids with special needs and English-language deficits, Esquith does not advocate shutting out kids who struggle to learn. In Chapter Thirteen, Esquith explains that he mentally divides kids into three groups—Kid One is eager to learn and completely committed to school; Kid Two is what Esquith calls “the Man in the Middle”—average, often quiet, usually overlooked; Kid Three “hates everyone and everything”. Most teachers, says Esquith spend most of their time on Kid One and Kid Three. Esquith says he focuses on Kid Two because “(t)here is a Kid One inside many of them. It’s just that no one has ever developed him.” By reaching the Middle Man, he adds, you can often shift the balance of power in a classroom and sometimes even bring along Kid Three. Esquith never mentions KIPP, Levin or Feinberg by name. As with most worthwhile books, it becomes important to read between the lines. “My goal is to teach the children a set of values that they internalize…I am suggesting that while some of the latest trends may work in the short run, they are a quick fix. As you grow as an instructor, it’s better if your lessons have a longer-lasting effect. So beautiful. Right on in every paragraph. Can we please return our Free Public School System to real teachers like this one and so many others ready to resume control.